Hi there, good to see the ORIC scene is still active. 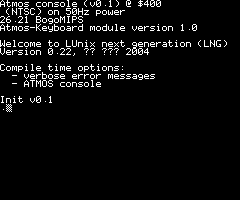 I started porting LUnix NG sunday, and got to the point where the kernel wants to load the shell. Next step will require disk support, but due to the multiple hw and fs around, and the fact that the only disk support in LUnix is for a higher level C64 interface I'll have to design this from 0. For now it must be loaded from tape, must write something to put them in a floppy image. A Jasmin or Microdisc is still needed though to enable overlay ram, else it'll complain and reboot. Requires 48K, well, actually 64K. Current binary also checks for 2nd VIA to select bank 0. At least console and keyboard now mostly work, just some scolling issue. I hope I'll have something demoable for Alchimie 6, in case anyone is in France in october feel free to have a go. I know they had some ORIC demos in the past. I just zipped up my current source and uploaded it. Not much to see yet though. The code in kernel/oric/reset.s and kernel/oric/reboot.s to detect the drive to disable the ROM and get the overlay, and get back the ROM to reboot might be of some interest to others. I spent some time getting the keyboard to work... current code is probably not optimal. It only checks for one column per IRQ, so produces a keycode once every 8 IRQs. sometimes it doesn't pick a key but it works enough to be usable. This is a very interesting project! Anyway I allways found it challenging and now that you have started with it, I will follow your progress with a lot of interest! The console now scrolls correctly. LUnix already has its own TCP/IP stack, including PPP support though. I wrote a simple vtapefs to transfer files from euphoric in a simple way. I switch the ROM back, put the file name at $27f or so and call the k7 funcs and let euphoric trap those and return bytes from the file. k was to test calling the ROM GETSYN and RDBYTE (shouldn't work as lunix takes over page 0, but in euphoric the code is not actually run). sources updated at the same location. I'd like to port Contiki's ui on top of that if it works... but it seems C support is not really there yet. the calling convention is not really consistent.